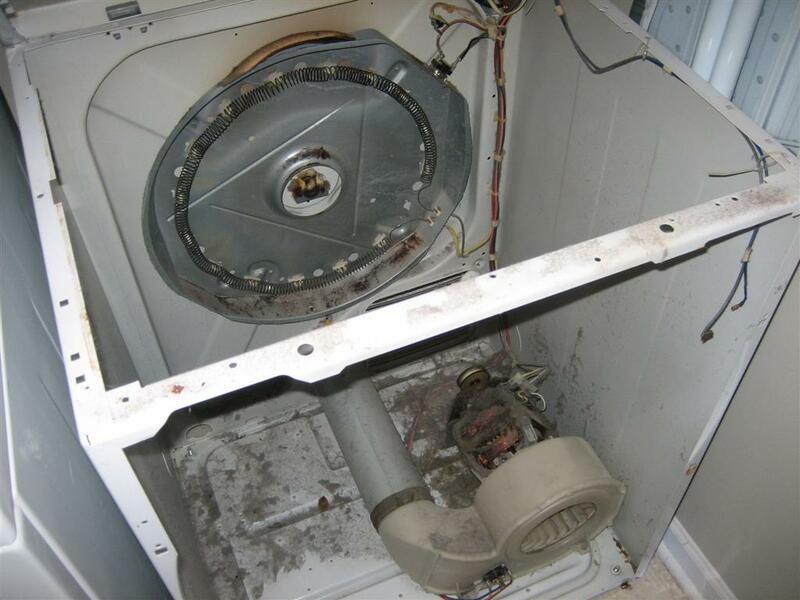 About two weeks ago, our ~10-year-old dryer started squeaking pretty badly with every rotation of the single-piece drum. (A single piece drum is one where the back wall spins, too. If the back wall is stationary while the “walls” turn, you have a two-piece drum.) 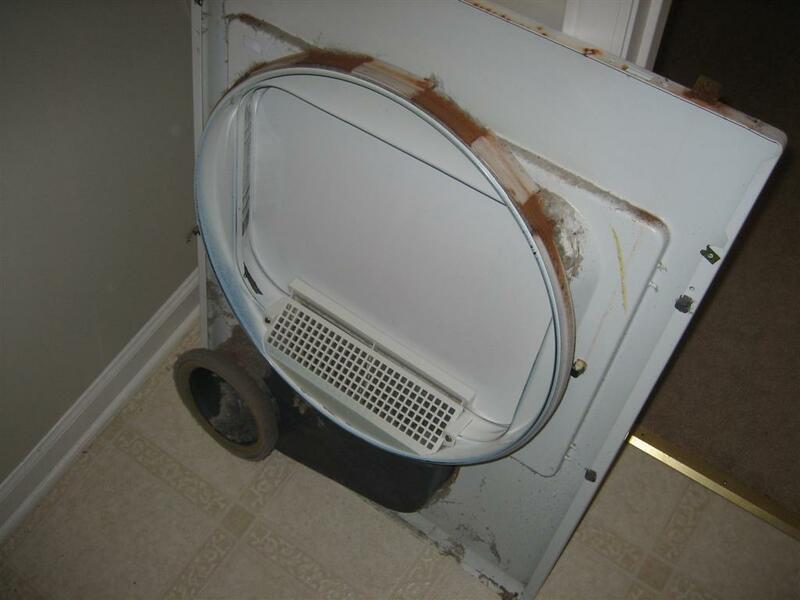 Anyway, since it was with every rotation of the drum (as opposed to the faster rotation of the motor or ventilation (lint filter) fan), I knew it was probably one of the supports for the drum. 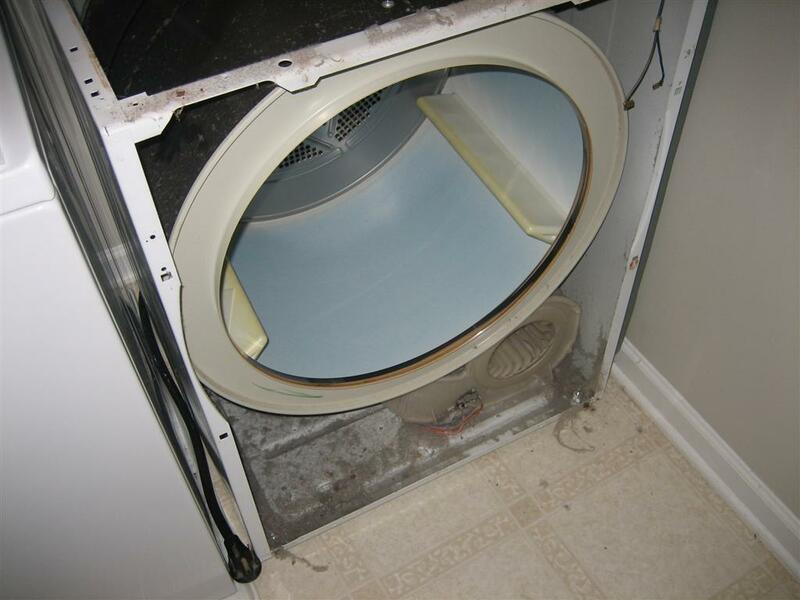 After doing a little bit of google research, I stumbled acrross this thread, and a very helpful gentleman who posted on how to fix a squeaky dryer. I don’t see why you couldn’t fix it yourself…it’s not really that difficult, but it can really be a bonus if you can have someone help you hold things together at one point. 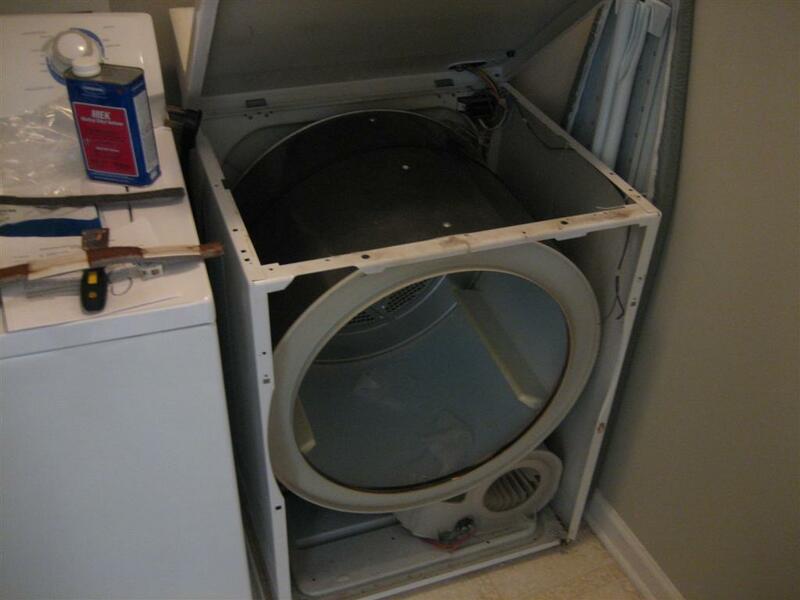 It (the dryer) is serviced from the front. 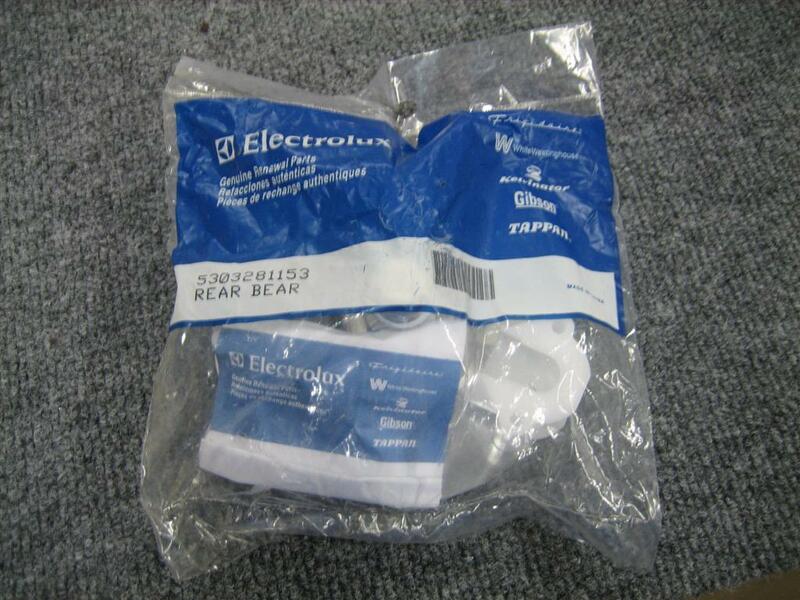 The part number you will likely need is 5303281153. 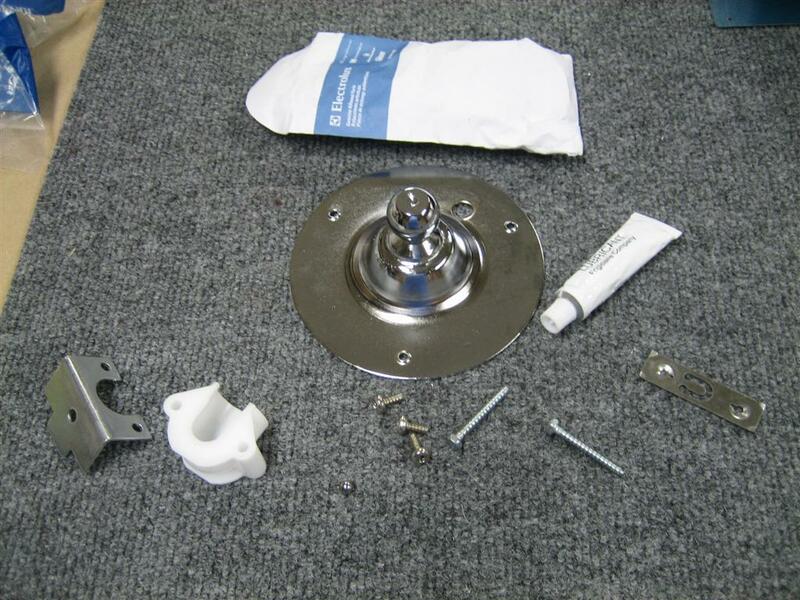 This is a kit that contains every part that could possibly need to be replaced when dealing with a rear drum bearing. Okay, here's the kit. Let's get started, I need clean underwear! Here are the pieces in the kit. 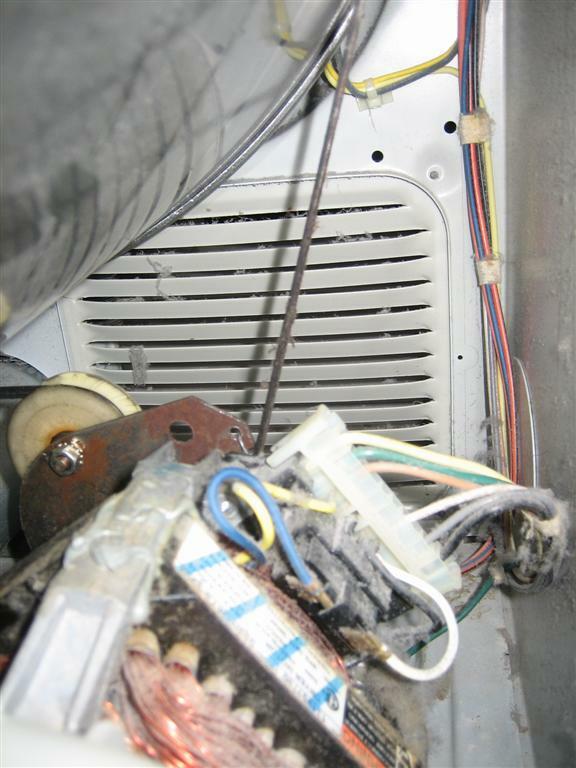 First, unplug the dryer from the outlet or remove power at the breaker/fuse panel. 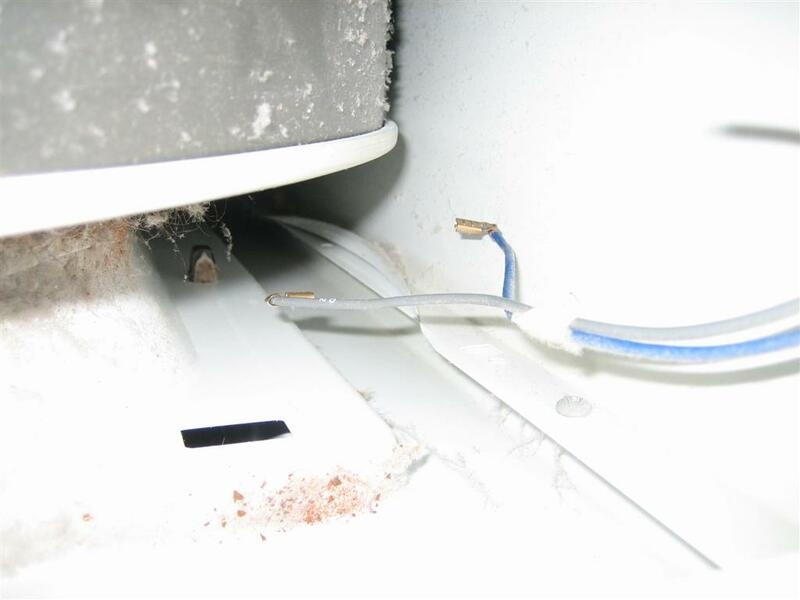 To raise the top of the dryer, insert a putty knife into the crack between the top and the front panel and push against the spring clips to release them. There are two clips, anywhere from 23 to 8 inches in from the sides. You should be able to feel the spring tension when you push on them. Push one in slightly, and raise that side, then the same for the other end of the main top. those clips were pretty rusted. I had to wrestle with them a little to get them to disengage. Luckily, I could see them from the front of the dryer, so I didn't need to poke around a lot. 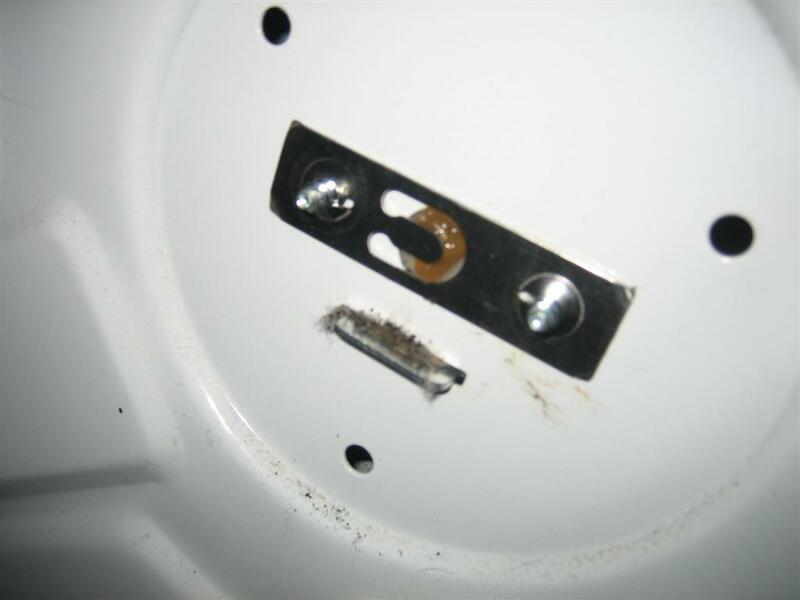 Once the top is up, you will disconnect the wires to the door switch (right side, on the backside of the front panel), if there are 3, mark them somehow to get them back correctly, if only 2 wires, no need as location makes no difference. I only had two wires. That hole on the left is where the back of the switch comes through. 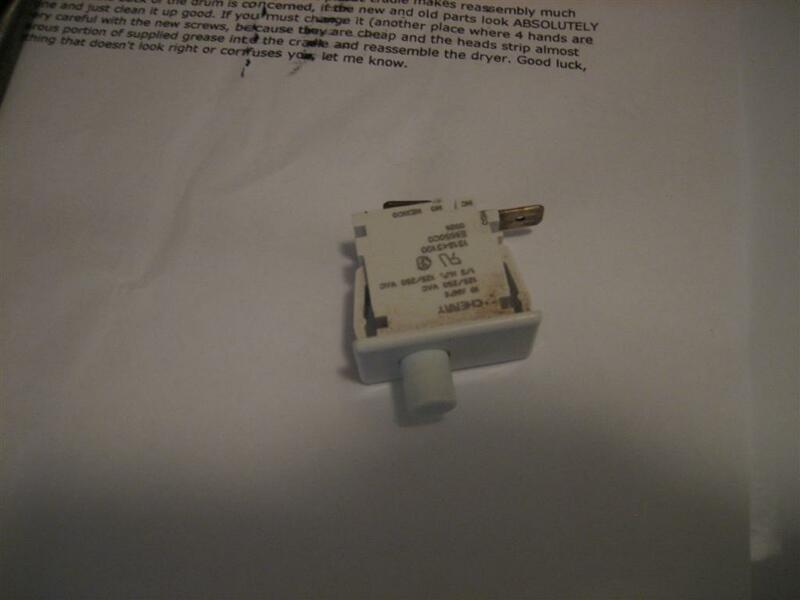 It was easier for me to actually removed the switch to pull the connections off. a push tab on either side and it slide right out. Then remove the phillips screw holding the yellow tab-looking plastic thing front and center in the top of the front panel. Then remove the 2 screws holding the front panel to the side panels, screw heads are inside the cabinet, screws pointing towards you. 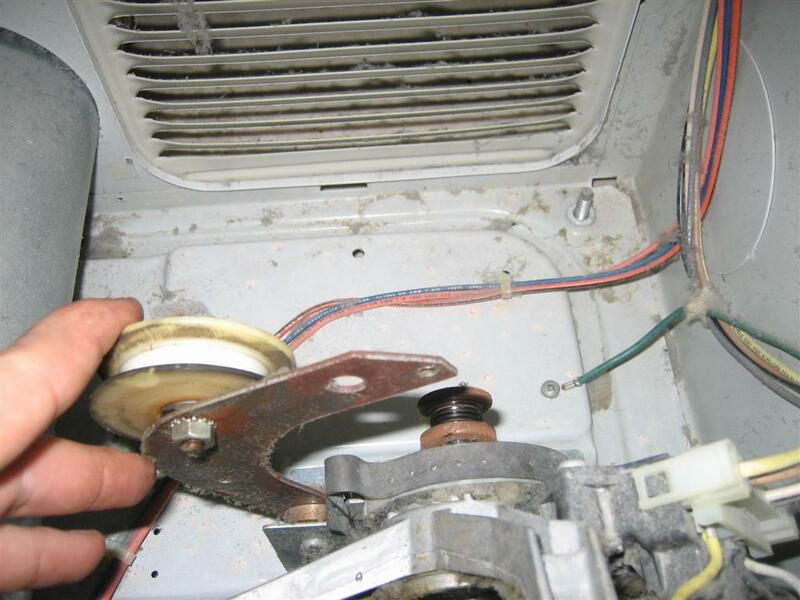 Pull the front panel away and lift off the bottom clips to remove. Here's the (very dirty) front panel removed. 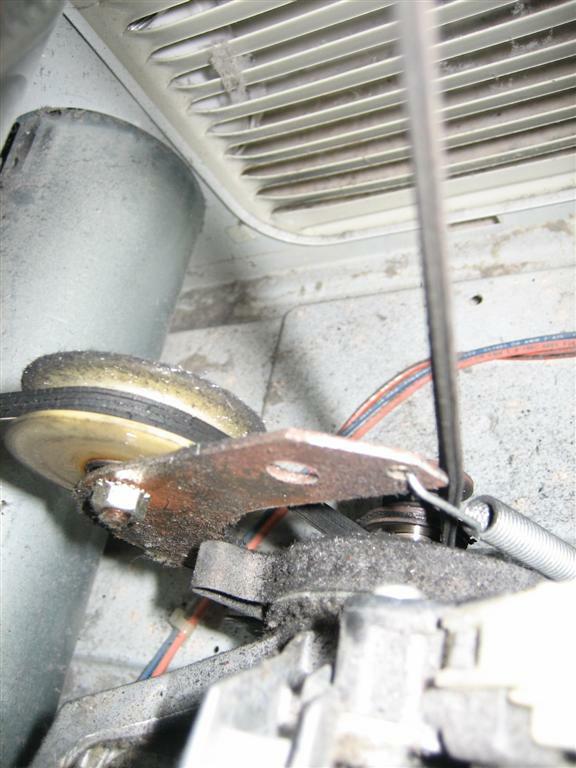 Now remove the belt from the idler pulley. 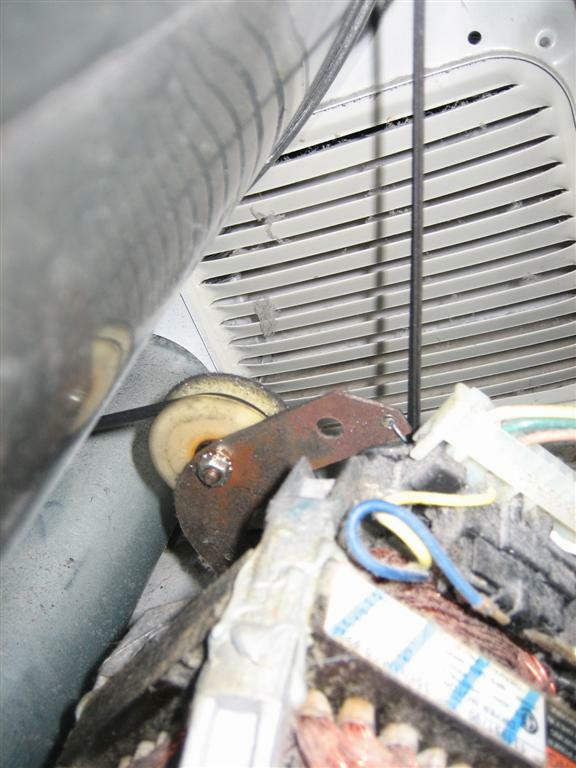 The idler is located right behind the blower/motor unit. 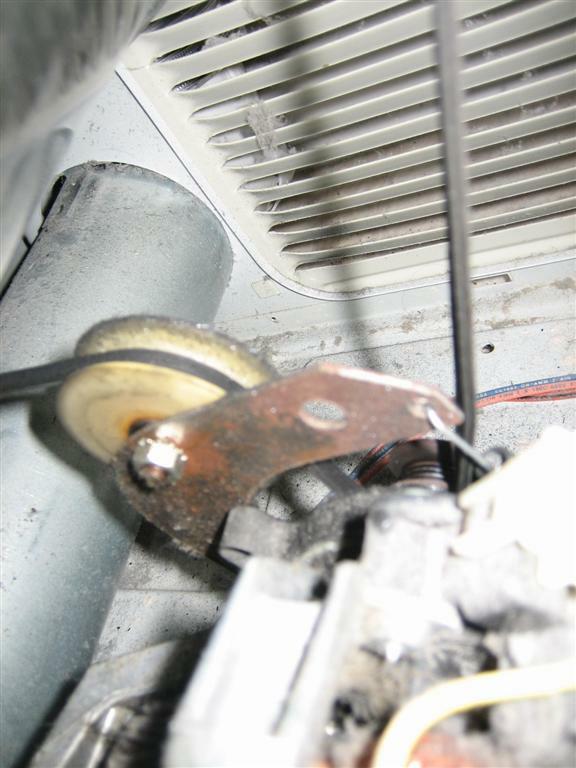 Make sure to note how the belt goes around the idler so you get it back on right. 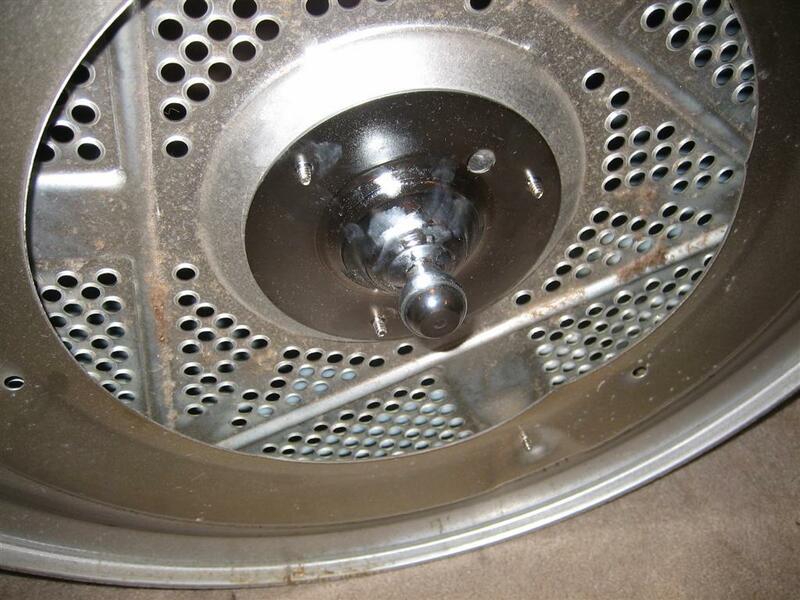 Once the belt is free, slide the belt to the back edge of the drum and, using it as a handle (on the top side of the drum), lift straight up to disengage the rear bearing from the cradle. This can be a very tight fit, especially if it worn badly. You may have to pull relatively hard. Once done, the drum will pull out through the front of the cabinet. Now you can see the drum support ball on the back of the drum and the cradle that holds it. Simply keep note of how you remove the cradle from the back wall to reassemble it correctly (this is where 4 hands are better than 2 and don’t loose track of the ground bearing from the back). 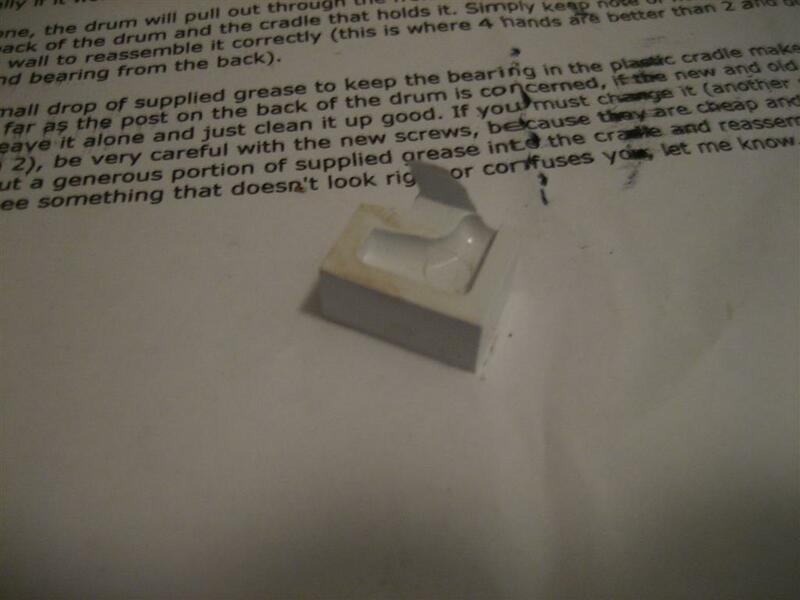 Using a small drop of supplied grease to keep the bearing in the plastic cradle makes reassembly much easier. This was a little bit of a stretch, but I got it installed using one arm in back and one in the front. 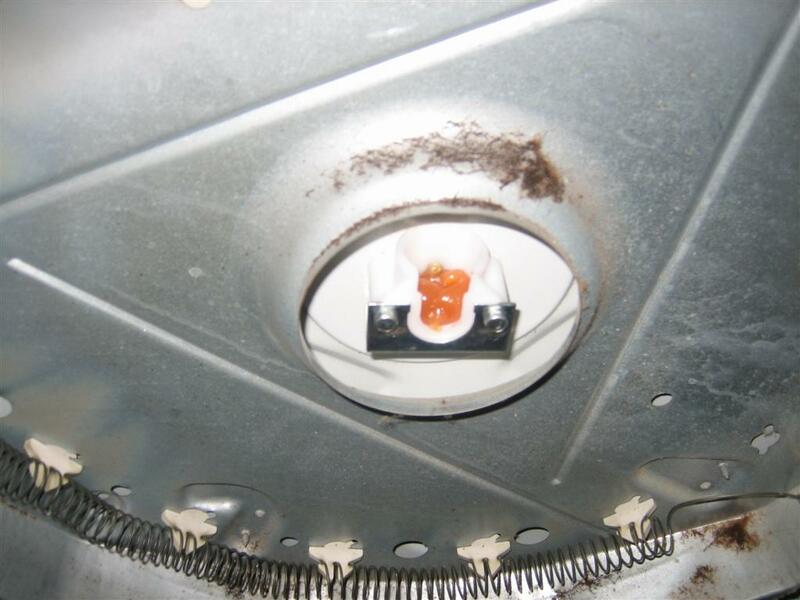 Once you get the screws started through the wall holes and into the plate from behind, the ball will stay put and you can move to the front to tighten these bolts down. Here's a shot from the back. You can see the little tab that keeps the bearing in place. This broken plastic piece fell out while I was working. My dad used to tell me (no he didn't) that it wasn't done right unless you had extra pieces when you were done. Check. 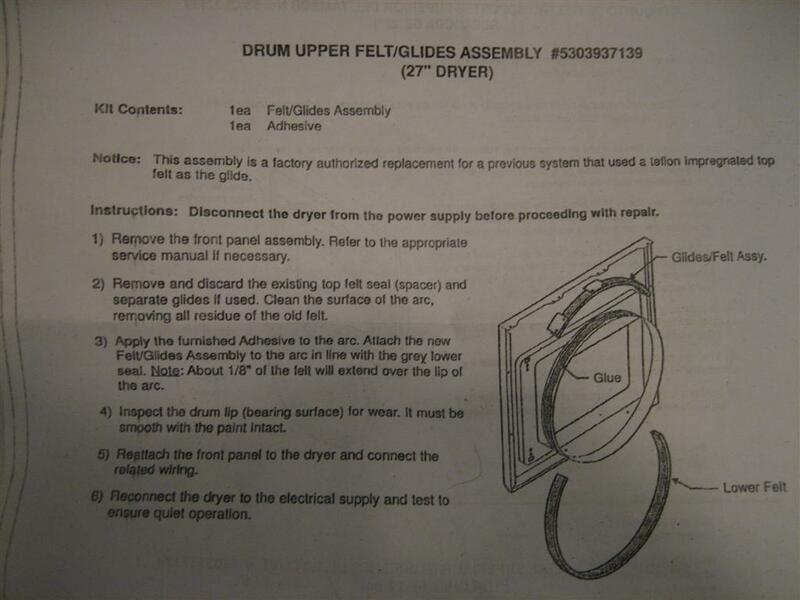 As far as the post on the back of the drum is concerned, if the new and old parts look ABSOLUTELY identical, leave it alone and just clean it up good. If you must change it (another place where 4 hands are better than 2), be very careful with the new screws, because they are cheap and the heads strip almost instantly. 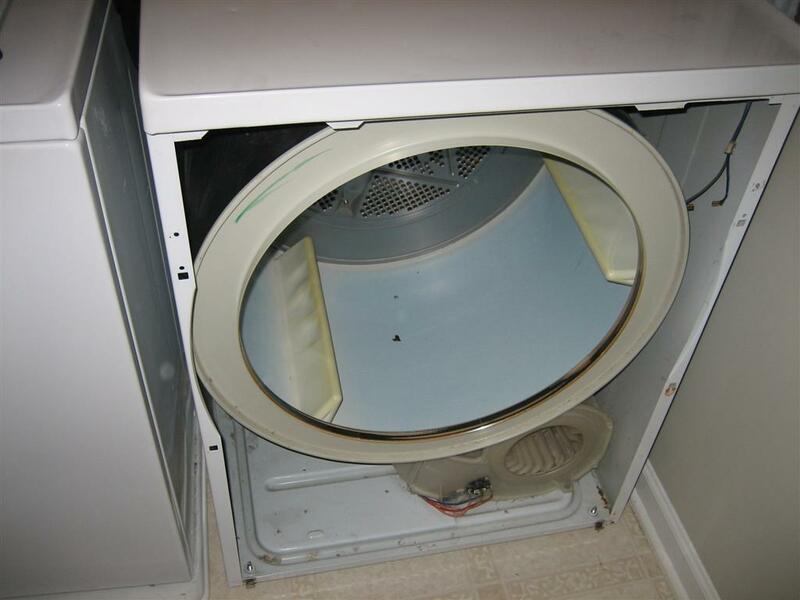 Put a generous portion of supplied grease into the cradle and reassemble the dryer. Good luck, and if you see something that doesn’t look right or confuses you, let me know. I didn't know what "generous" was, so I just filled the puppy up. Okay, here is where the directions stopped. I found the missing spring after cleaning up a little. I also spent a little time looking at the pulleys. I did remember that the belt came down on the right side, under the small pulley, then over the larger pulley to the left. The l-shaped bracket holding the larger pulley has a hole on the left side. 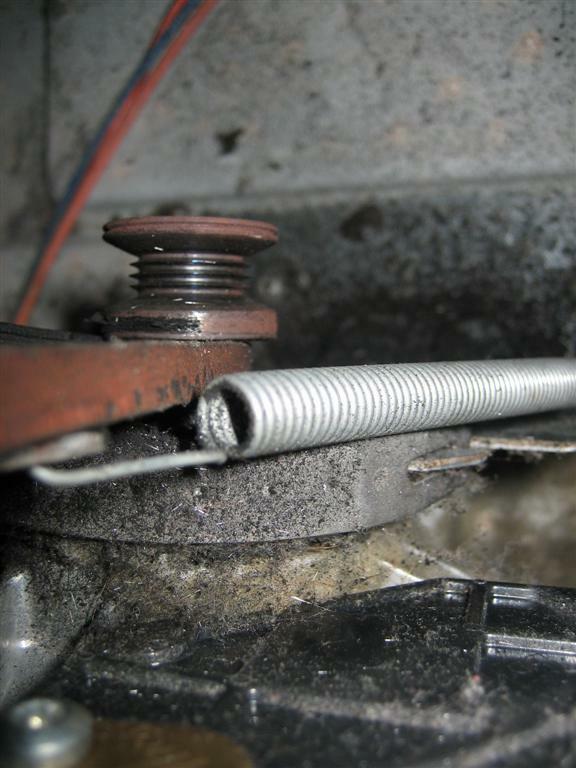 This is where the spring attaches. 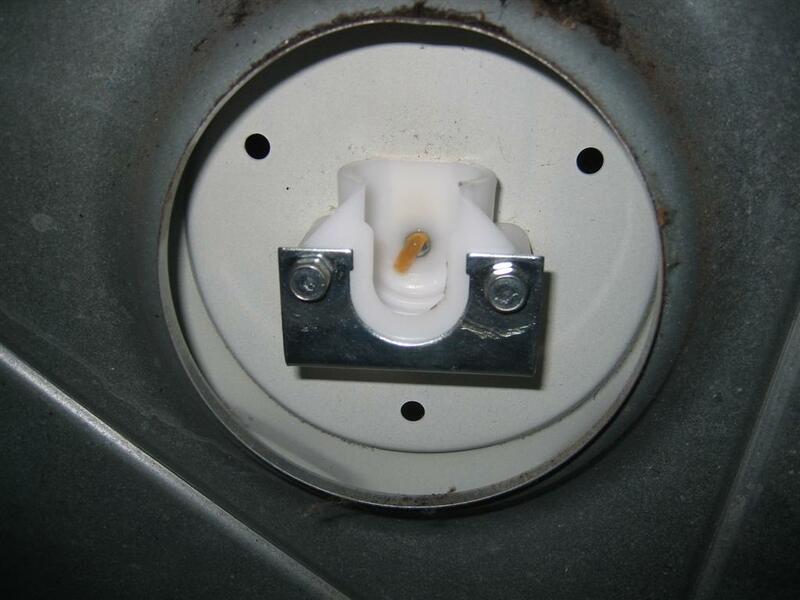 that small little hook on the right side of the aluminum bracket on the right is for the other side of the spring. Remember how you said that our plan for tonight was to relax. Well, unfortunately, the dryer will need your additional attention. The dryer no longer squeaks, but it also no longer spins. I opened the dryer this morning to get the clothes out from last night and found a very wet blob. I’m sorry love. After figuring out that I probably stretched the belt while using it to help lift the drum out, I was positive all I needed was a new belt. 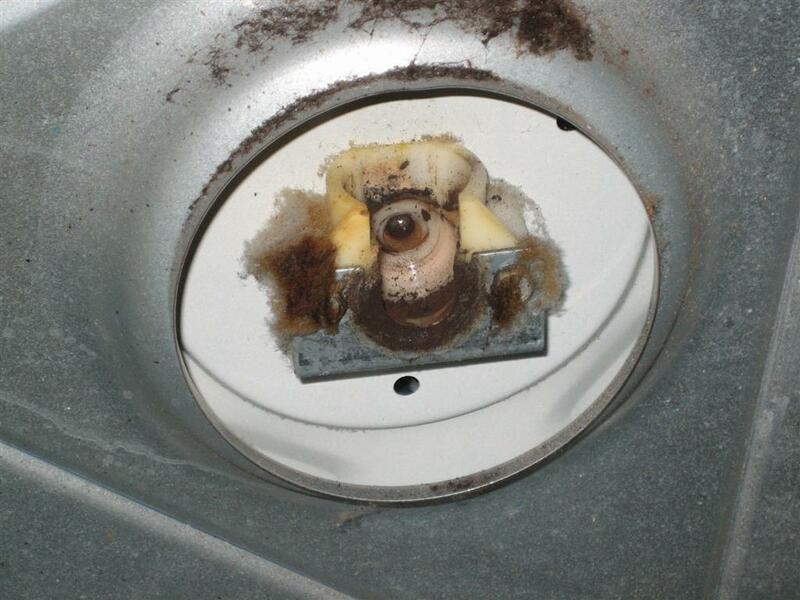 Also, the dryer did start making another noise, and it wasn’t so much a squeak as a grinding. So I jumped online and bought a new belt and a new felt runner. They arrived today, and I jumped into taking the dryer apart again. FRont is off,, the top is propped up. First thing, let’s attack the grinding. 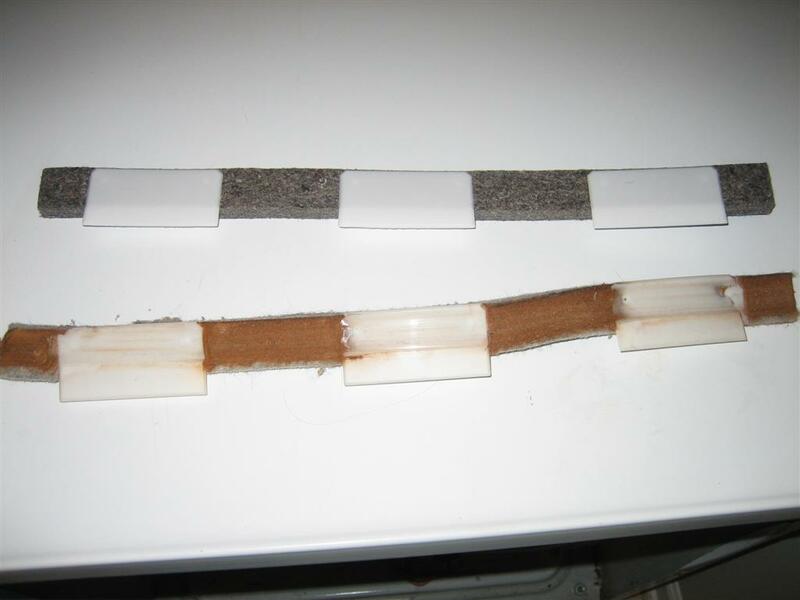 Here is the old and new felt pieces with the plastic runners. It goes on top of the front pieces round lip. The drum sits on top of the runners and spins. Then, I needed to remove the old belt to put the new one on. Let me just get my camera in there (can’t see due to tight fit with the hands) to see what’s going on. I snapped a few pictures and then looked at them on the camera. Okay, this is how I remember it from last time. Wait a minute. It looks like the belt is rubbing up against that pulley arm. When I was threading the belt onto the smaller pulley last time, I got the spring attached, and everything kind of snapped into place. 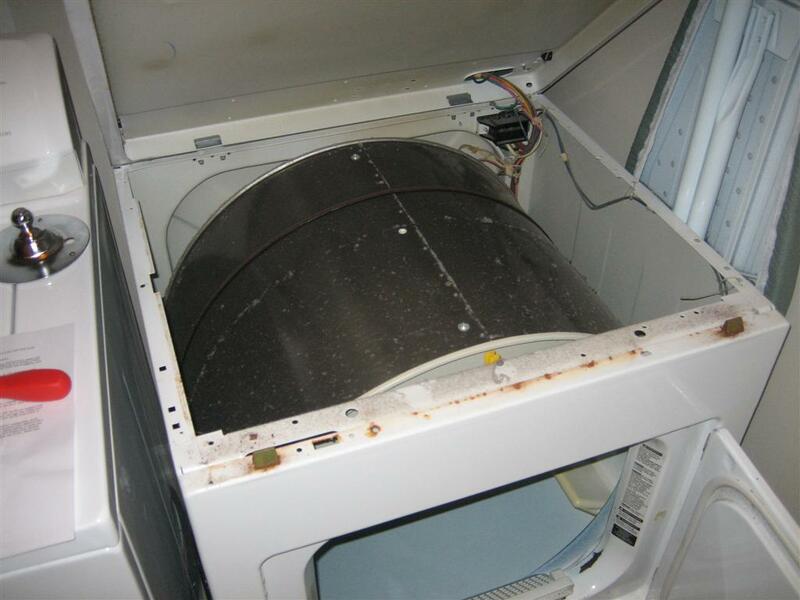 I thought it was good, and when I tested the dryer, the drum spun, so I assumed it was good. I should have looked closer. Now, I guess that means that the spinning problem is fixed. 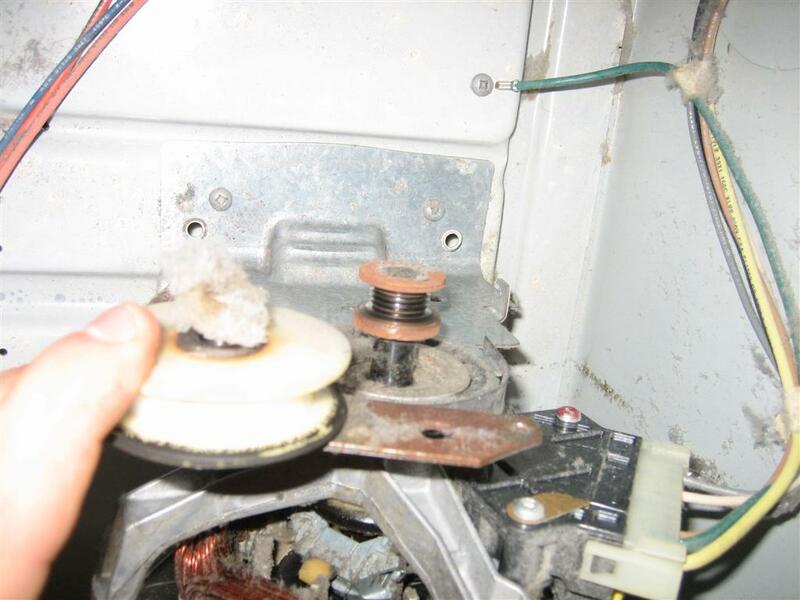 Maybe the belt rubbing was causing the grinding, too. Maybe I should get my money back for both pieces! Oh, I already opened and installed the new felt piece. Okay. I’ll get my money back for the belt. Wait. It was $7, and shipping back to the store will be more expensive. I decided to keep the new belt in inventory, and leave the existing belt on there. After putting everything back together, I have a nice silent, and strongly-spinning dryer again. Here's the felt glides assembly, just so you know what I was replacing. This entry was posted on Thursday, May 6th, 2010 at 6:09 pm and is filed under Other. You can follow any responses to this entry through the RSS 2.0 feed. You can leave a response, or trackback from your own site. Thank you for a great and detailed article!! I used this today to fix my own dryer. 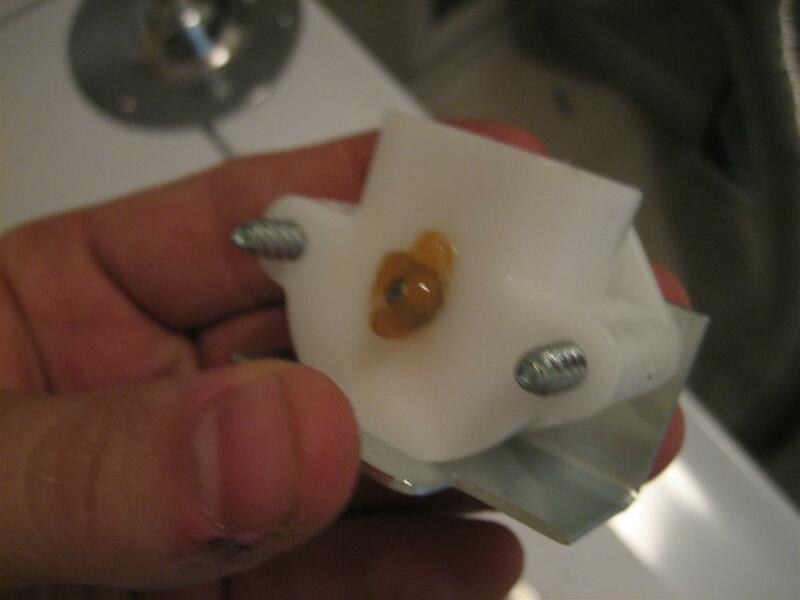 Without this I would not have known where that tiny ball bearing came from or went.